Australia will implement GHS for workplace hazardous chemicals (both substances and mixtures) from 1 Jan 2017. The model Work Health and Safety Regulations (WHS Regulations) issued in 2011 impose a duty on manufacturers and importers of chemicals supplied to a workplace to correctly classify the chemical according to GHS Rev. 3, label hazardous chemicals in workplace and provide safety data sheets. There is no separate guidance on chemical classification in Australia. The new WHS Regulations directly reference UN GHS Rev. 3. The following building blocks are not adopted. It shall be noted that there are two non-GHS hazard classes in Australia: AUH070- Toxic by eye contact and AUH071 - Corrosive to the respiratory tract. They shall be included in SDSs or on labels if applicable. Safe Work Australia has published a list of chemicals classified in accordance with GHS. The classifications are non-mandatory under the WHS Regulations, and should be used as guidance only. Australia has adopted standard GHS label elements for workplace hazardous chemicals. 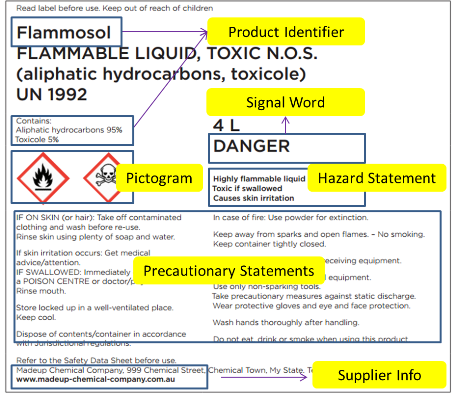 The picture below is an example of Australian GHS label given by Safe Work Australia. Like many other countries, Australia also has its own unique labelling requirements. Such requirements are set by the Code of Practice for Labelling of Workplace Hazardous Chemicals. The format and content of Safety Data Sheets (SDS) are set by the Code of Practice for the Preparation of Safety Data Sheets for Hazardous Chemicals. A SDS prepared in accordance with GHS regulations in other countries (for example, the EU CLP Regulation must be checked for compliance with the WHS Regulations and amended if necessary to bring it into compliance. Section 15: Indication of whether a hazardous chemical is subject to the control of International conventions and domestic regulations such as NICNAS. Click here to access all references and resources for Australia including regulations, regulatory lists and useful links to the websites of competent authorities.